ROCHESTER, N.Y., June 13, 2017 /PRNewswire/ -- Vuzix® Corporation (NASDAQ: VUZI), ("Vuzix" or, the "Company"), a leading supplier of Smart Glasses, Augmented Reality (AR) and Virtual Reality (VR) technologies and products for the consumer and enterprise markets, is pleased to announce that the Company has removed the "Pre-Order" restriction status of the M300 Smart Glasses on the Vuzix website so that they can be openly purchased. It has also launched a line of accessories for the M300, which was built and designed specifically for the enterprise. The M300 Smart Glasses are now available for purchase by Vuzix value added resellers (VARs), registered developers, Enterprise companies, and the general public. The Vuzix M300 Smart Glasses leverage the company's proprietary rail system, which enables a variety of M300 industrial mounting options including; left or right eye users, hardhats, safety glasses, traditional glasses as well as medical headbands. The versatility of the device coupled with slide and play mounting options makes the M300 an ideal solution for enterprise workers across diverse environments including construction, manufacturing, field service, warehousing and logistics, telemedicine and Biopharma. 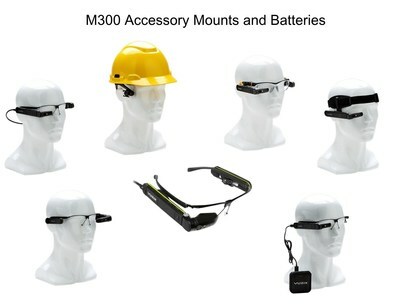 The Vuzix M300 accessory line includes items like hot swappable on-frame batteries, left and right eye safety helmet mounts, 9000 mA external battery, micro USB power adaptors as well as a prescription ready safety glasses kit and an M300 carrying case. The full line of M300 accessories can be accessed through the following link: http://files.vuzix.com/Content/pdfs/Vuzix-Accessories-Catalogue-v6_17.pdf. If you are interested in placing an order for the M300 you can do so through the following link in the United States https://www.vuzix.com/Products/AddToCart/68 or through our European link https://www.vuzix.eu/Products/AddToCart/68. Certain statements contained in this news release are "forward-looking statements" within the meaning of the Securities Litigation Reform Act of 1995 and applicable Canadian securities laws. Forward looking statements contained in this release relate to the M300 Smart Glasses and its related accessories, and among other things, the Company's leadership in the Video Eyewear, VR and AR display industry. They are generally identified by words such as "believes," "may," "expects," "anticipates," "should" and similar expressions. Readers should not place undue reliance on such forward-looking statements, which are based upon the Company's beliefs and assumptions as of the date of this release. The Company's actual results could differ materially due to risk factors and other items described in more detail in the "Risk Factors" section of the Company's Annual Reports and MD&A filed with the United States Securities and Exchange Commission and applicable Canadian securities regulators (copies of which may be obtained at www.sedar.com or www.sec.gov). Subsequent events and developments may cause these forward-looking statements to change. The Company specifically disclaims any obligation or intention to update or revise these forward-looking statements as a result of changed events or circumstances that occur after the date of this release, except as required by applicable law.